TMC is the first hospital in the Texoma area to provide this service. This minimally invasive procedure may offer patients less risk of bleeding and infection as well as a faster recovery compared to traditional brain surgery. The biplane system has two rotating cameras that recreate detailed 3D views of the blood vessels leading to the brain, within the brain and their relationship to the tissues of the head and neck. 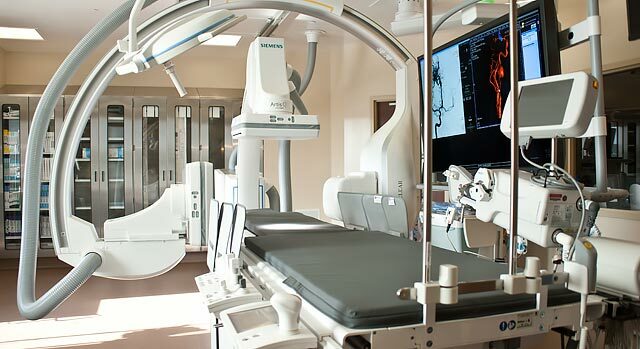 The system is capable of producing images simultaneously from two regions of a patient’s head, from front to back and side to side, decreasing the amount of time it takes to complete a neurological angiogram. If you need a referral to a neurologist or other physician at Texoma Medical Center, call our free physician referral service at 1-903-416-3627.